Good Morning friends! Hoping that you have a great day ahead of you spending time with folks you love! I'm headed into the office today to sub for my friend so she can spend the day with her daughter and grandchildren. It will be nice to see the patients that I haven't seen in a long time! Last night, after our BLT's (Wednesdays are our farmers market so I get fresh tomatoes and we have BLT's all summer)...I made my way out to my workshop to create today's card. 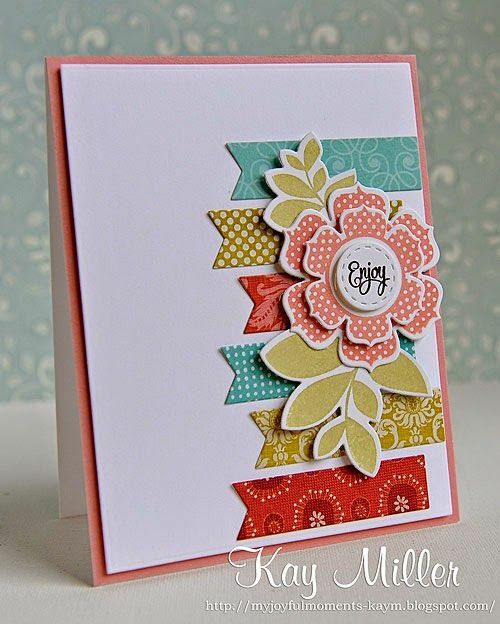 It's another INSPIRED card from my Pinterest board "Cards I LOVE! Finding Inspiration". When I finished, I realized it's kind of TROPICAL...wonder why that's on my mind? 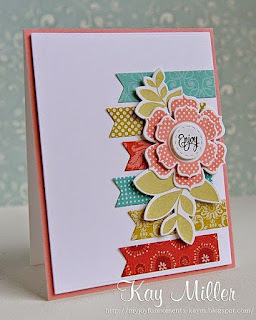 To make this card I used the colors Bermuda Bay, Daffodil Delight, Watermelon Wonder, Pear Pizzazz and Whisper White. The first mat is 4" X 5 1/4" in Watermelon Wonder with the Whisper White mat in 3 3/4" X 5". I cut 3/4" strips (I actually used scraps) from three different designer papers, using both sides of the paper. I used the new Banner Triple punch to make the strips into banners. The flower was stamped with the Flower Shop stamp set. I stamped off because I wanted it lighter than the designer paper. I punched it out with the Pansy Punch an cut one more out of cardstock. I added some Metallic Sequins and Basic Rhinestones....just because I wanted a little bling! Of course I decorated the inside of the card, but I didn't add a sentiment because I wasn't sure what I wanted to use this card for! It would make a FUN birthday or thinking of you card, but I'm thinking I might use it to send my son a thank you card for taking us to Maui! ...and here is my inspiration! Thanks bunches for stopping by! Have a terrific day!